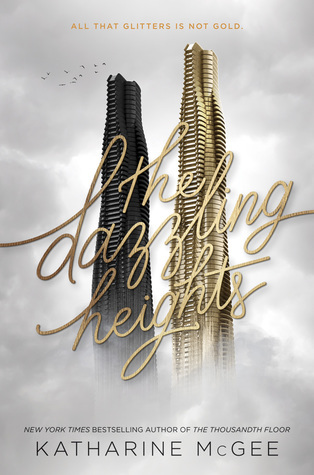 The Dazzling Heights by Katharine McGee. But the thing about the truth was that once you learned it, it became impossible to unlearn. No matter how many pills Leda popped, it was still there, lurking in the corners of her mind like an unwanted guest. They were friends again, and therefore any enemy of Avery’s was now an enemy of hers. She was still Leda Cole, damn it, and no one hurt the people she cared about. With the first book I was unintentionally spoilt about the identity of the victim but with this one, I took good care to avoid any such thing. And thus I found myself hoping that it wasn’t one of my favourites and just a little bit wishing that it might be one of the others. And that wish shifted while I was reading because I had to shift allegiances a little during this second book. I’m usually quite set in my affections but here I find that it’s mostly a degree of whom you find least loathsome … in a way at least. I understand all their motives and struggles to an extent but their ultimate way of handling things is maybe a little above my pay grade. The only thing I really have difficulty understanding is one of the main “secrets” regarding Avery because I don’t think it’s that big of a deal. But maybe I was raised in a too liberal mindset. But now I suspect the group has enough tension among itself plus most likely another secret that will either bind them forever or be their downfall. I’m very intrigued to find out how this will play out or possibly fall to ruins in the next book. Have you had a character in a book you wished would die only to suddenly find that there is maybe another one you loathe even more? Share your experiences and teasers in the comments! Ooh, this sounds good. Great quotes and great cover too.